Most advertising lacks context, and most advertisers no longer assume that potential buyers are literate, rational or analytical (See Amusing Ourselves to Death: Public Discourse in the Age of Show Business). 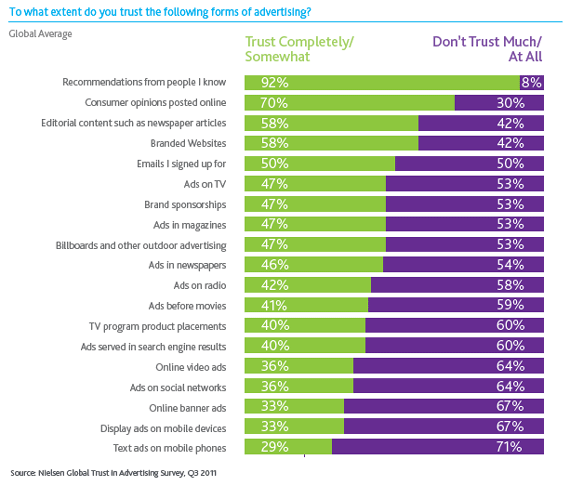 There’s little room for trust in the modern advertiser’s vocabulary when attention is the first order of business. Add in an overstimulated consumer, and it’s no wonder the most trusted forms of advertising are recommendations from people already known and (potentially) unbiased reviewers.